Wilson, R., Goodman, J., Bradbury, L. & Gross, L. (2013). Exploring the use of iPads to Investigate Forces and Motion in an Elementary Science Methods Course. Contemporary Issues in Technology and Teacher Education, 13 (2), 105-126. Waynesville, NC USA: Society for Information Technology & Teacher Education. Retrieved April 22, 2019 from https://www.learntechlib.org/primary/p/42134/. Baser, D., & Yildirim, Z. (2012). Is technology integrated into science: A case of elementary education. E-Journal of New World Sciences Academy, 7(2), 841-847. Burbules, N. (1993). Dialogue in teaching: Theory and practice. New York NY: Teachers College Press. Cox, M.J., & Webb, M.E. (2004). 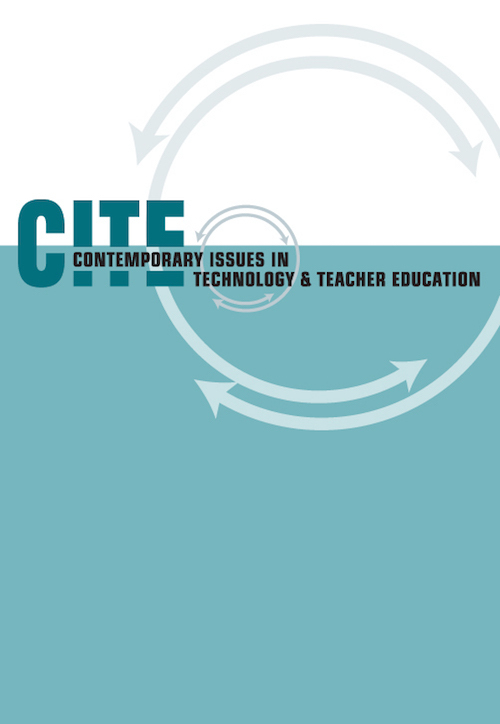 ICT and pedagogy: A review of the research literature. London, England: British Educational Communications and Technology Agency/ Department for Education and Skills. Linn, M.C., & Hsi, S. (2000). Computers, teachers, peers: Science learning partners. London, England: Lawrence Erlbaum Associates. Luehmann, A., & Frink, J. (2012). Web 2.0 technologies, new media literacies, and science education: Exploring the potential to transform. In B.J. Fraser, K.G. Tobin, & C.J. McRobbie (Eds. ), Second international handbook of science education (pp. 823-837). Meurant, R.C. (2010). IPad tablet computing to foster Korean EFL digital literacy. International Journal of u-and e-Service, Science and Technology, 3(4), 49-62. Mistler-Jackson, M., & Songer, N. (2000). Student motivation and internet technology: Are students empowered to learn science?. Journal of Research in Science Teaching, 37(5), 459-479. Norris, C.A., & Solloway, E.M. (2003). The viable alternative: Handhelds. School Administrator, 60(4), 26-28. Phillips, D. (Ed.) (2000). Constructivism in education. Chicago, IL: University of Chicago Press. Rodrigues, S. (2007). Pedagogic practice integrating primary science and elearning: The need for relevance, recognition, resource, reflection, readiness and risk. Technology, Pedagogy and Education, 5(2), 175-189. Salomon, G., & Perkins, D. (1998). Individual and social aspects of learning. In P.D. Pearson& A. Iran-Nehad (Eds. ), Review of research in education (Vol. 23, P.1-24). Sun, K., Lin, Y., & Yu, C. (2008). A study on learning effect among different learning styles in a web-based lab of science for elementary school students. Computers& Education, 50, 1411-1422. Waight, N., & Abd-El-Khalick, F. (2007). The impact of technology on the enactment of "inquiry" in a technology enthusiast's sixth grade science classroom. Journal of Research in Science Teaching, 44(1), 154-182. Wallace, R.M., Kupperman, J., Krajcik, J., & Soloway, E. (2000). Science on the web: Students online in a sixth-grade science classroom. Journal of the Learning Sciences, 9(1), 75-104. Webb, M.E. (2005). Affordances of ICT in science learning: Implications for an integrated pedagogy. International Journal of Science Education, 27(6), 705-735. Wegerif, R., Littleton, K., & Jones, A. (2003). Stand-alone computers supporting learning dialogues in primary classrooms. International Journal of Educational Research, 39, 851-860. Wenger, E. And Lave, J. (1991). Situated learning: Legitimate peripheral participation. Cambridge, UK: Cambridge University Press. Williams, M. (2008). Moving technology to the center of instruction: How one experienced teacher incorporates a web-based environment over time. Journal of Science Education and Technology, 17(3), 316-333.